BASKETBALL SPOTLIGHT NEWS: AC Showcase 4th Grade Preview: The Baby Ballers Are Ready To Go! AC Showcase 4th Grade Preview: The Baby Ballers Are Ready To Go! Can "LIL Dug" Help Glory Raise The Trophy In AC? The Basketball Spotlight 4th Grade Division gives a look into the future and promises to have some serious battles. Here’s a look at the top baby baller teams headed down to AC. Team Glory: Fresh off their Potomac Valley Championship these boys come in as definitely one of the favorites. 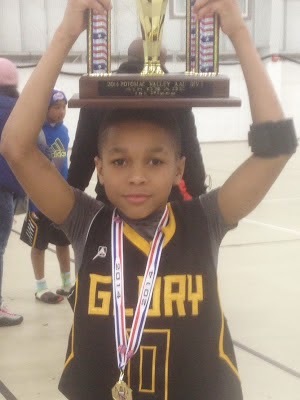 Their guard play is tremendous including the nations #1 floor general Knasir “Lil Doug” McDaniels. I know they will be ready for some work. Riverside Hawks: We haven’t seen the Hawks since they won the Tip Off Classic and now they will be trying to add some hardware at the AC Showcase. They will be bringing that New York fire to this event and we can’t wait. We All Can Go All Stars: Better believe that this squad is bringing the noise from Tennessee. We expect some full court pressure combined with some running and gunning. Let’s get at it. Gauchos: This bracket has to include the Choz. The Bronx Club is searching for their first Spotlight championship of the season. The water at this tournament is filled with sharks so hopefully they can make it to the other side. MJ Heat: The coach of the Heat says this team is one of the best in the region. We haven’t seen them this season but this event will really put them to the test. Playtime Panthers: The Green and Black are known to bring the noise. This program has been a mainstay on the NJ young basketball scene for years. CMEK: These young guys are relatively new on the scene but feel they are ready for the big bump. They got what they want because this field is loaded. Also Look Out For: Expressions, Rens, Team Future and House Of Sports.